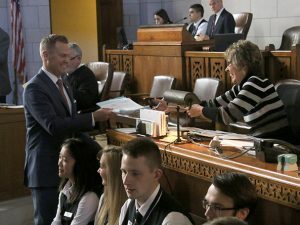 Sen. Brett Lindstrom submits a bill. LB491, sponsored by Omaha Sen. John McCollister, which would create the offense of fraudulent misrepresentation of a service animal and provide penalties. New bills may be introduced until Jan. 18. Supreme Court Chief Justice Michael Heavican will give the State of the Judiciary address in the legislative chamber Jan. 19 at 10 a.m.
Committee hearings begin this afternoon. Schedules can be found at NebraskaLegislature.gov.